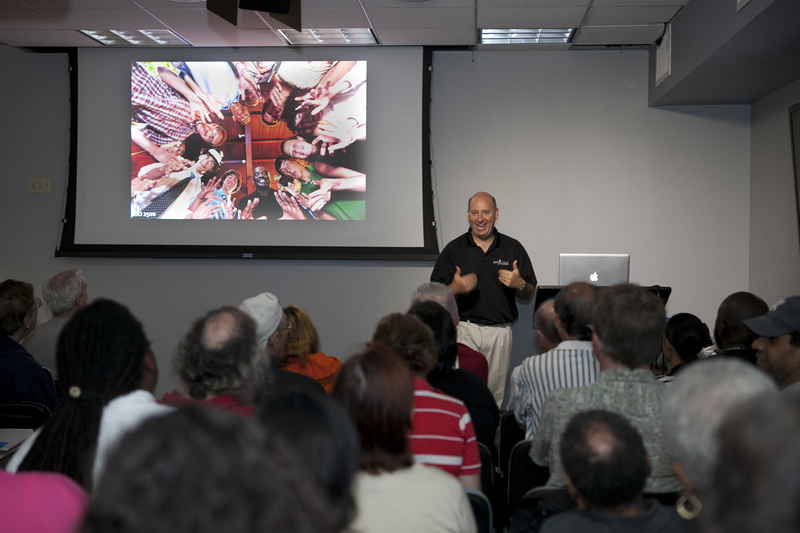 On Tuesday, I had the honor of doing two presentations at the world's largest photo store, B&H Photo in Manhattan. The first presentation was called "Portrait Photography - With Minimal Equipment" where I showed many of my favorite portrait photos and talked about the best techniques for capturing them. As the titled stated, the goal was to show how to capture really nice portraits without tons of equipment. Most of the images that I showed were taken with my DSLR and one on-camera flash. We had a great time during this 2 hour long class, and from the feedback that I have received, it sounds like people learned some new ideas and had some fun too. Everything went smoothly until the very end, after my presentation was over, when one of the participants attacked another to grab one of my give-away memory cards. What the heck?! Not cool! And then after a 2 hour lunch break, I came back to do the second presentation, which was called "How To Make Money Photographing Events". 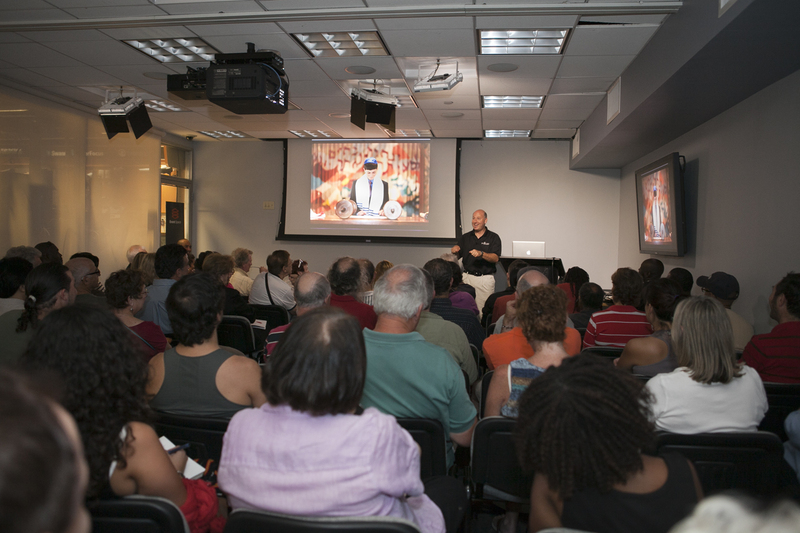 Once again we filled the room and I shared my tips on how to be a successful event photographer. I showed many of my favorite images taken at Bar / Bat Mitzvahs and weddings, and I even through in some from the 2010 Winter Olympics. 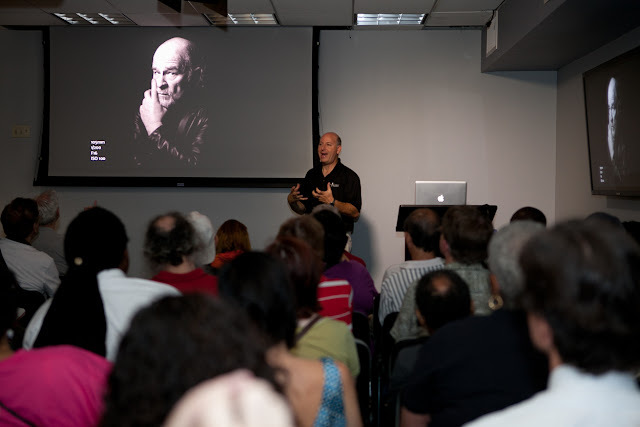 I talked about photographic tips, but mainly focused on the business aspect of photography. Luckily, this time we did not have any assaults happening in the back of the room! I was really lucky to meet so many great people (minus one) and truly appreciate them coming out to see me. 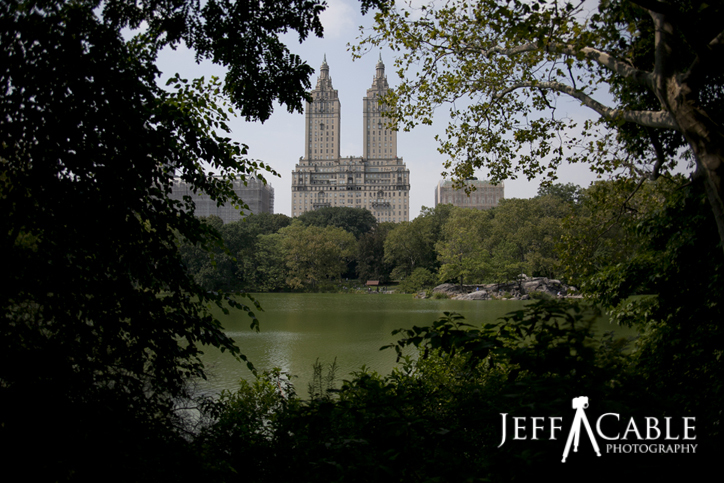 After finishing my presentations and answering a lot of questions, it was time to go out and shoot some images in Central Park. Here is one of the images, with more to come in an upcoming blog. A couple of weeks ago, my neighbor (and model for many years) was in her last days at home before heading back to college, and we decided to do one more shoot before she left. I have always wanted to shoot portraits in a pool, getting the lens really close to the water level. So, we decided to use their pool and meet just before sunset on the following day. Well...we were running a little late and lost all of our direct sunlight, so we took some images in flat light. These would serve as a test for another shoot, a little earlier on the following evening. * The photos look more natural when her hair was wet (we started out with her hair still dry). * We needed to pay more attention to the brushing of her hair and get it behind her ears. * Even though I was in the water, I needed to keep my lens low to the water line for best results. * Due to the reflectivity of the water, I needed to shot in burst mode to get varying results. * Even though the images were nice, we needed directional (reflected) light to make it more interesting. So, now that we had our checklist of modifications, we set out to improve on the images from day one. You can immediately see the difference that the reflected sunlight makes to the images. Bridget's skin has a much warmer golden color and the colors are more pronounced. Using the direct sunlight coming from behind Bridget, I had her move so that her hair was rim-lighted and then had her brother hold a reflector to bring some more light to the left side of her face. As we were shooting, and the light was dropping quickly, I became more aware of the variance between the light and dark areas of the images. Working with a reflector, we added light to the left side of Bridget's face and I dialed down the exposure compensation of the camera to -0.3, to add an even more dramatic look to the images. These last two images are my favorites. Bridget has amazing eyes, and I really wanted to capture that in my photos. The combination of dramatic lighting and her piercing eyes really makes for beautiful photos. I wish I could take full credit for these, but as is many times the case, it is the subject that makes the picture, even more than the photographer! Last weekend was another fun trip to Safari West, which is located near the Napa Valley in Northern California. This time, I was up there to teach photography to some of the photo buyers from Target. On Thursday evening, I spent an hour and a half teaching them how to take control of a DSLR camera, get it out of automatic mode, and get creative. Then, after spending a night in the African tents (and dealing with a whole lot of noisy birds who apparently don't believe in sleeping), we got up on Friday morning, hopped into a couple of their open air vehicles and headed off to explore the 400 acres. I brought Canon DSLR cameras and various long lenses (between 200mm and 300mm) for the students to use, while I used my Canon 5D Mark II with a 100-400mm lens. The photo above was my example of shooting at a wide open aperture, keeping the face and eyes in perfect focus but having everything else go soft in the background. The great thing about Safari West is that you can get up close and personal with so many different animals. These shots of the giraffes were taken when we drove right into the open area with them. I swear...I get no respect...not even from the animals! The rhinoceros are not the most active of animals, but they are pretty cool to look at. These two were at the lower area of the property, and then we drove up into the hills. We came across a herd of cape buffalo who were lounging around, minding their own business. This guy was nice enough to look up at us to let us get a nice portrait. I love the long curved horns on the Oryx. This image was an example of shooting in portrait mode (tall) vs. shooting all the images in landscape mode (wide). I like this shot of an Eland who was walking behind one of the Zebras. The contrast between the Zebra's stripes and the Eland's brown hair, help make the photo more interesting. This Gemsbok was hanging out underneath some tree cover when we came around the corner. He turned and looked right at us and I grabbed this shot. After taking the two hour tour of the property, you can walk around the "base camp" area and see some really cool animals in there pens. 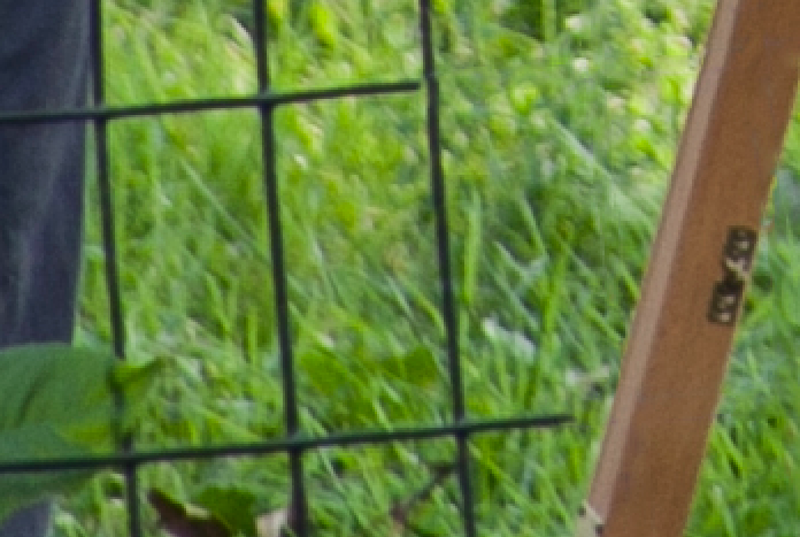 They even have this beautiful Cheetah (obviously in a caged area). I was teaching the students how to shoot through a fence to try and make the foreground wires almost invisible. These Ring-Tailed Lemurs were too cute. They were taking some time to clean each other when I stopped by for some photos. Also on the property are some really interesting birds. And because you can walk around and get really close to them, this makes for an outstanding photo opportunity. Not to be forgotten, there are numerous Tortoises cruising around the property. And they actually move faster than you might expect. As we were finishing up our 3 hour tour of the property, we watched these two Giraffe as they bumped necks (a show of dominance). We all took a lot of images of these two animals and they performed this act for us. If you are interested in visiting Safari West, you can check out their web site at: www.safariwest.com.